If you are interested in learning more about the meanings, properties, and uses of the January birthstone, you’ve come to the right place. We have put together a few of the fascinating facts accompanying these gems for centuries. As attested by the American National Association of Jewelers, both traditionally and from a modern custom perspective, the gemstone corresponding to the first month of the year is Garnet. Now that we have answered to “what is the birthstone for January”, let’s shortly define this stone. Garnets are a group of minerals of similar chemical composition that have been used for various purposes over millenniums. These semi-precious gems have the following scientific names: almandines, demantoid, hessonite, pyrope, rhodolite, tsavorite, and many more. First things first, let’s find out where these abrasive stones come from. 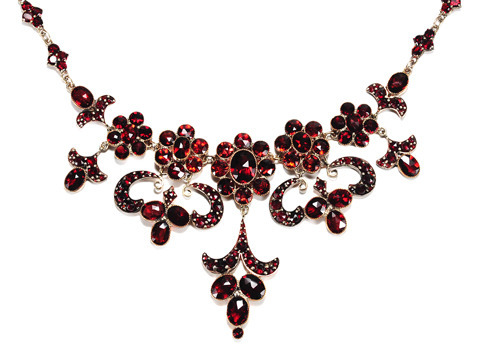 Originally found in America, garnets are widely produced today in Sri Lanka, India, and Africa. Tanzania, Australia, Argentina, and Myanmar are also noted as some of their most important sources. As concerns the etymology of the January birthstone, the word “garnet” derives from the Latin “granatum”, which stands for “seed”. As the most familiar shape of garnets is roundish, and most of them are vividly red hued, these gems are reminiscent of pomegranate seeds. Are there other birthstones for January? Well, although there are months that have multiple representative gemstones, Garnet has always stood as the birthstone for the first month of the year, at least in Western cultures. According to Eastern traditions, however, the birthstone for January is Serpent Stone. They keep away negative energies if worn as talismans. They help in healing inflammations. They increase self-awareness and self-esteem. In the first century, the Roman-Jewish scholar Titus Flavius Josephus believed that there is a strong connection between birthstones, astrological signs, and the twelve holy stones in the breastplate of Aaron. He based his belief on the interpretation of the Book of Exodus, where all twelve stones are recorded. Similar metaphysical beliefs have invested garnets with incredible meanings, and they soon became part of mysterious practices. Legends say that these rainbow-colored minerals have protective powers as they would keep their wearers away of the evil eye, nightmares, and accidents. Luminosity is another essential characteristic of gems that influenced popular beliefs. Legends say that a garnet helped Noah steer his ark through dark nights. These may be the basis of people trusting in its protective meaning, and wearing it as a talisman over millenniums. Wearing garnets as January birthstones does not correspond, though, to ancient practices. This is a modern custom based on lists of birthstone created by national associations of jewelers such as The Jewelry Industry Council of America and Britain’s National Association of Goldsmiths. The first references to garnet uses are tracked in the 3100 B.C. Egypt, where the gemstones were used in jewelry making. In recent times, they are used for industrial purposes. As garnets are abrasive minerals, they can cut steel and polish glass. These gems, if pure, make also excellent personal pieces of jewelry. This vivid crystal comes in a variety of colors. The Bohemian Garnet is mesmerizing red while the Mandarin Garnet is vibrant orange. Also, the Russian Demantoid and Tsavorite Garnet are wonderfully green-colored. The color spectrum also includes brown, purple, pink and black. Among the most valuable garnets, the blue-hued mineral takes the first place. Discovered only two decades ago, in Madagascar, this is extremely rare and sought by gemstone lovers. 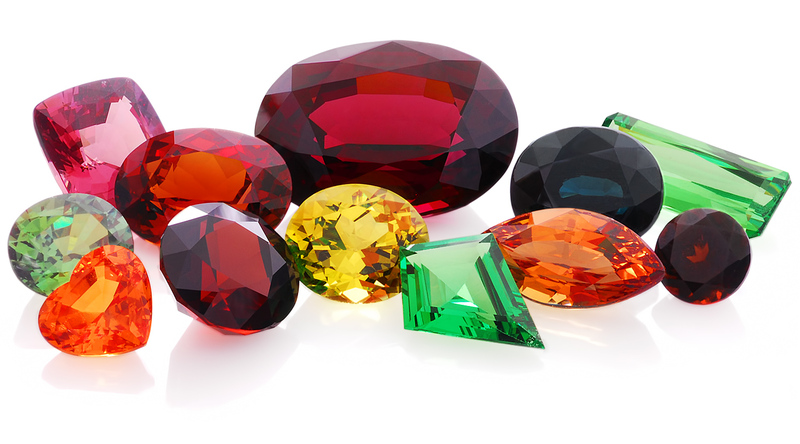 Alternatively, the most common garnet is the fiery red one. Red, green, orange or yellow, garnets are all symbols of trust, long lasting friendship and vitality. 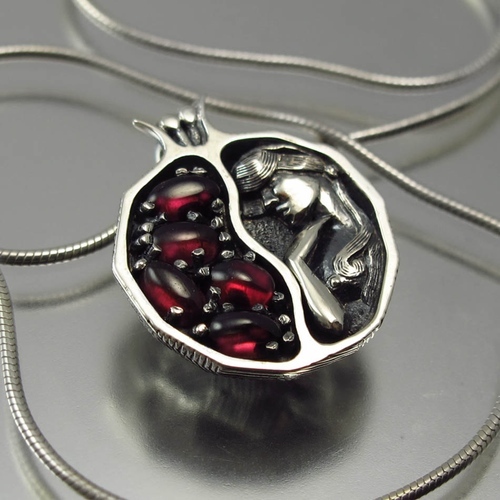 Red garnets are particularly associated with fire, thus with power. They have been worn for protection from dark forces, strong faith, and regeneration. Thus, if you are born in January, no matter if you are a Capricorn or Aquarius, wearing January birthstone jewelry will invest you with more of their mysterious powers. A January birthstone ring is best worn by those born in the first month of the year. A garnet engagement ring would all the more so stand as the ideal gift for “Januaryans”. As garnets are astrologically associated with Capricorns, those governed by this sign would enhance their well-known strengths such as perseverance, self-confidence, and tenacity. A January birthstone necklace would make that special someone look fabulous. Be careful, though, not only she would attract all eyes on her, but also the envy of other women. Garnets are also the perfect gift for travelers, as they are associated to light and guidance. Scientifically speaking, the January birthstone has a high refractive index. From a metaphysical point of view, still, these gems are thought to help you increase your self-confidence and energy levels. For further reading, take a look at our Birthstone Jewelry Guide. There you will discover more about birthstones meanings for each month. We also recommend a few notable books on gemstone symbolism where you will also find information about birthstones. Bruce G. Knuth, Gems in Myth, Legend, and Lore. Parachute: Jewelers Press, 2007. Allison Augustyn and Lance Grande, Gems and Gemstones: Timeless Natural Beauty of the Mineral World. University of Chicago Press, 2009. Rupert Gleadow, The Origin of the Zodiac. Dover Publications, 2001. Photo Credits: Multicolour.com, Library.hrmtc.com, Reeds.com, Epochbeads.wordpress.com. Hey Buddy!, I found this information for you: "January Birthstone: Meaning, Properties & Uses". Here is the website link: https://accessgems.com/january-birthstone-jewelry-guide/. Thank you.